Dialing into the details was the ticket to victory for Jared Lintner, winner of the 2018 Bass Pro Shops Bassmaster Opens Championship on Table Rock Lake, who weighed in a total of 37 pounds for the three-day competition. Continuing with the Trump Administration's all-of-the-above energy policy, the Secretary spoke at the American Wind Energy Association’s Offshore Wind Conference and announced 1.) much-anticipated wind auction in federal waters off the coast of Massachusetts; 2.) the environmental review of a proposed wind project offshore Rhode Island; and 3.) the next steps to a first-ever wind auction in federal waters off of California. The National Shooting Sports Foundation®(NSSF®) has awarded its highest Five-Star rating for excellence to the Guns N Gear range and indoor shooting range located in Idaho Falls, Idaho. DeSantis Gunhide introduces 18 holster fits in our Pegasus line for the GLOCK 45. These include the #M65 Invader, #042 Facilitator and others. Pachmayr's GuardianGrip is now available for the Ruger LCR. What makes the GuardianGrip so unique is its patented finger extension. With the simple press of a button, the spring-loaded finger extension drops down out of the grip, converting a two-finger compact grip into a controllable three-finger grip. The Michigan departments of Health and Human Services (MDHHS) and Natural Resources (DNR) today issued a ‘Do Not Eat’ advisory for deer taken within approximately five miles of Clark’s Marsh in Oscoda Township. Streamlight Inc. donated more than $700,000 over the past 10 years to the Breast Cancer Research Foundation, a not-for-profit organization seeking to prevent and cure breast cancer. Each October, Streamlight recognizes Breast Cancer Awareness Month by highlighting its line of pink lights, the proceeds of which are contributed to BCRF. Pro Ears, an Altus Brands, LLC company, announced that Source Outdoor Group of Gainesville, Georgia, is its marketing firm of record. Pro Ears electronic ear and hearing protection technology allows competitive shooters, hunters and law enforcement agents to hear sounds, including conversation, even during high volume noise spikes. The 2018 Holiday Sportsman Show is a digital holiday sales promotion, a consumer-interactive virtual show, a content marketing event and an e-commerce sales generator all in one. It has been nearly a year since the trade war commenced, with the landscape changing almost daily. NMMA is encouraged by some developments, but tariffs on the recreational boating industry continue to take their toll. The Bonefish and Tarpon Trust’s Development and Events Coordinator works closely with the Director of Development and Communications to plan and execute successful events and other fundraising efforts that support Bonefish and Tarpon Trust. GLOCK refers to media reports discussing pending patent litigation between SIG Sauer, Inc. and GLOCK GmbH. In January 2018, SIG Sauer, Inc. filed a patent infringement suit together with a motion for a preliminary injunction against Glock GmbH in the Commercial Court Vienna, Austria. It is ROOOOOSTER time on Outdoor Sportsman Group’s online streaming platform, MyOutdoorTV (MOTV). Apex Tactical Specialties has expanded its Flat Dark Earth trigger options with the addition and immediate availability of a new Flat Dark Earth anodized version of its popular Flat-Faced Forward Set Trigger Kit for the M&P M2.0 model pistols from Smith & Wesson. The new Timberwolf Large frames are now available for pre-order. Based on the Glock platform, they are compatible with any G20, 21, 40, or G41 slide and are only fractionally larger overall in grip circumference than a Glock 17 frame. The new Browning X-Bolt Pro Long Range rifle is built to offer hunters top accuracy at extended ranges. It is available in eight popular calibers, including 6.5mm Creedmoor and has an MSRP of $2099.00-$2,179.99 depending on Caliber. For hunters that prefer the appearance and warmth of a wood stock, Winchester Repeating Arms® has introduced a new Sporter model to the XPR®bolt-action rifle line. On Saturday, November 3, more than two dozen community partners, including Trout Unlimited, Resource Institute, the U.S. Forest Service and Foothills Conservancy, will host a public party to celebrate the anniversary of the legislation, and announce new community projects to further enhance Wilson Creek. Hundreds of reels and rods, thousands of flies and collections, assorted gear, fishing art prints, signed fishing books and much more are part of this huge on-line auction from the estate of American's most famed and loved fly fisher, who passed away in March this year at the age of 93. The digital Holiday Sportsman Show was created for one singular purpose, to efficiently bring holiday internet shoppers together with outdoor companies during the critical fourth quarter shopping season, without any major investment on your part. The digital Holiday Sportsman Show was created to efficiently bring holiday internet shoppers together with outdoor companies during the critical fourth quarter shopping season, without any major investment. Just as the name implies, this is a holiday sports show like any traditional consumer show but done in the digital world. Classes are being planned for this winter to teach adults the secrets and rewards of hardwater fishing - knot-tying, gear selection and use, fish identification and preparing your catch for the table. The Kentucky Department of Fish and Wildlife Resources encourages youngsters – and the young at heart – to put on their costumes and join the Salato Wildlife Education Center staff in Frankfort for the best trick-or-treat experience in town on Saturday, October 27. As a reminder, hunters who applied online for 2019 spring hunt permit-tags have until 11:59 p.m. (Arizona time) Thursday, October 25, to update their credit card or debit card account information, as well as purchase PointGuard to protect their bonus points. Women hoping to learn more about waterfowl hunting are invited to sign up for a free Beyond Becoming an Outdoors Woman workshop set for November 2-3, 2018, at the Nayanquing Point State Wildlife Area in Bay County, Michigan. Open to fly-tiers of all skill levels, the workshops include fly pattern changes each month as a way to encourage learning various new tying techniques and development of tying skills. The entire population of whooping cranes in the Central Flyway is expected to migrate through Nebraska over the next several weeks. The Nebraska Game and Parks Commission encourages the public to report whooping crane sightings. According to federal regulations, hunters are allowed to hunt standing crops or flooded standing crops unless that field has been manipulated. That means hunters cannot hunt flooded sunflower fields that were mowed as part of the dove season, nor can they knock down or clear standing crops to create an open area for ducks to land. The Arkansas Game and Fish Commission has voted to formally deny the petition of a complete closure on turtle harvest and heard the first reading of six new regulations changes aimed at managing the commercial harvest of turtles in the state. This week on The High Road with Keith Warren, Keith visits his stomping grounds, Legends Ranch, in Michigan for their annual Legacy Hunt. The High Road with Keith Warren airs four times weekly on the Pursuit Channel (DirecTV 604 and Dish 393). During my recent visits to gun manufacturers, I’ve been fortunate enough to try out several of their new (and still embargoed) rifles. Afterwards, I’m always amazed at the fact I seem to shoot their long guns better than my own. While visit SIG, I made that offhand remark to one of their Academy long-range instructors. 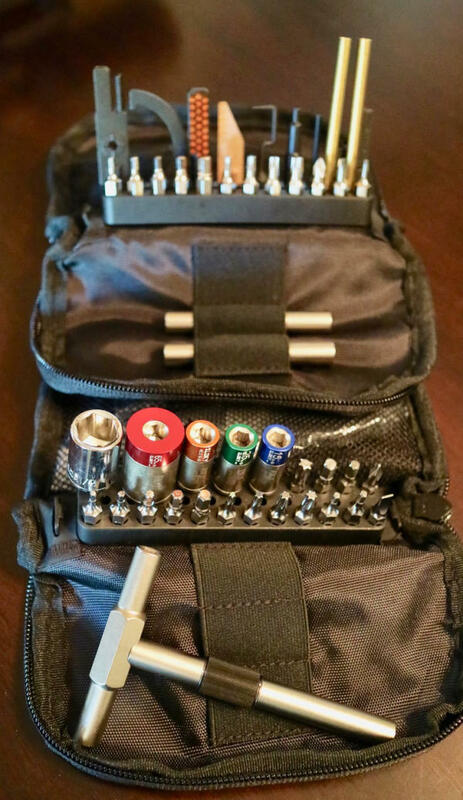 A pair of tool kits from Fix It Sticks can give you virtually anything you need to keep your MSR and your optics rocking along correctly. The AR-15 kit (top, MSRP $100) contains specialized scrapers and the deluxe field kit (bottom, MSRP $180) can handle virtually everything else that’s likely to work loose in the field. Since he’d already diagnosed another chronic problem of mine, I decided when I got home I’d check the scopes on a couple of my rifles at the opposite ends of my calibers: a DRD Tactical .338 Lapua with a Riton Optics RT-S Mod 7 4-20x50mm scope and a .22 caliber Ruger 10/22 with a Redfield Battlezone Tac.22 2-7x34mm scope. Both were solid at mid-ranges, but misses at longer distances had convinced me something wasn’t quite right in their setups. But checking would mean better tools- and techniques. Rifle setup doesn’t get a lot of fanfare at my house. I generally drop a rifle into a rest, eyeball it horizontal, attach the scope, set the eye relief, “adjust” the crosshairs using a convenient line on my wall, screw it all down, and head to the range. My instructor wasn’t the only one who already suspected setup might be part of my problem. While we were in SIG’s pro shop, everyone - including the instructors - had oohed and aahed over a pair of diminutive tool kits from Fix It Stick (wwwfixitsticks.com). One was just for MSRs; the second was described as a “Field Maintenance Kit” that contained a variety of tools - including miniature torque limiters ranging from 15 to 65 inch/pounds - especially for making certain everything was tightened into specifications in the field. Another of SIG’s instructors had already told me that if I’d not been torquing my mounts to the proper settings, he guaranteed that to be part of my accuracy problem. That was recommendation enough for me. And he didn’t steer me wrong. If you’re looking for ultra-compact toolkits, you might want to visit www.fixitsticks.com and check the line out. Their simple tools use an ingenious t-handle idea to offer high-quality tools that are also lightweight and portable. Turns out I already had the perfect bench accessory to make certain things were up to plumb -starting with my scope mounts. At SHOT Show last year, one of the guys from Inventure Engineering and Machining (www.inventeng.com) had given me a device called a Scope Setter. If I’d paid more attention after SHOT, I might have minimized some of the self-inflicted misses that may have been the result of my haphazard scope mounting techniques. 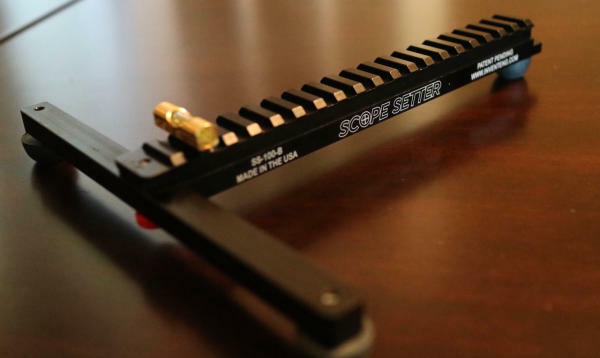 You have to start from a solid- and level- base and the Scope Setter ($119.95) offers you the ability to get your scope and bases off on a level footing via its ingenious mil-spec Picatinny rail (top) and bubble level (below). And it is small enough to travel in your range bag. It’s another device so simple on the surface that you miss the genius behind it. You have to get your bases level relative to the rail on your rifle. Otherwise, you’re starting out of whack. And as we all know, the further out you shoot, the more small errors multiply into big misses. This is the first time I’ve ever actually self-diagnosed and remediated an equipment issue. And the work was done at my desk, not on my gun bench. I removed the scopes and bases from the rifles in the shop, locked the rifles back in the safe, then brought the scopes and bases into the office. Then I mounted each of them on my pre-leveled Scope Setter. 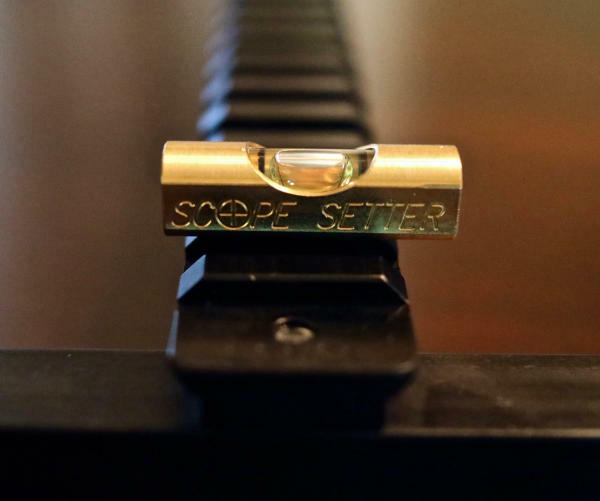 When mounted on a truly level rail, neither scope was anywhere close to level. And if you’re barrel’s not directly under your crosshairs, the x-ring is never in danger. And applying the torque limiters on the FixIt Sticks, I realized my definition of “level” wasn’t the only problem. The tension differences between individual screws was noticeable. As a drummer, I know uneven tension creates tonality problems in drums. Scopes, like drums, require uniformity to produce repeatable results. 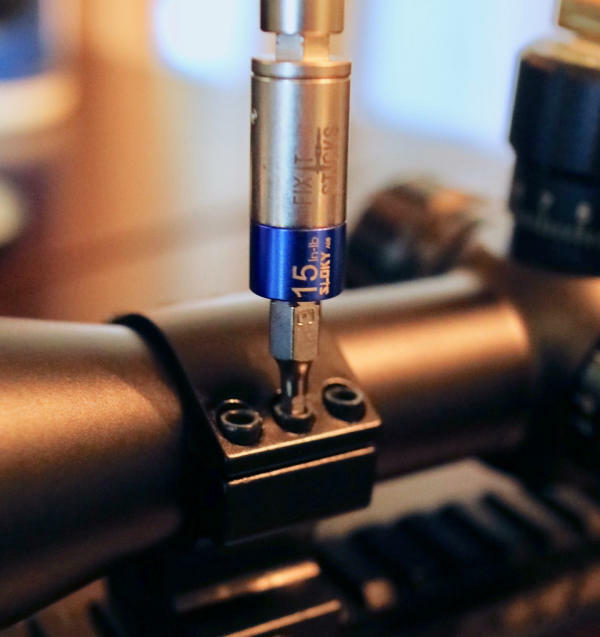 Using the Scope Setter as my base and the FixIt Sticks torque limiter to torque the screws in at precisely 15 in/lbs gave my rifles something they'd been lacking before -correctly mounted optics in precisely-tensioned mounts. Groups tightened -immediately. So I re-started the mounting process for both scopes. And it’s taken longer to describe what I did that it did to actually do it. From that point, it was a simple matter of remounting the scopes on the rifles (correctly torquing the cross bolts this time) and heading to the range. The differences were, well, eye-opening. Groups tightened with both rifles- including shorter distances. From a rest, I got tighter groups at every distance- but especially in the sweet spots of both these very different rifles. Now, I’m confident that these rifles are correctly setup so the optics are actually increasing my chances for hits, rather than guaranteeing I’ll miss- even if I do my part correctly. But for every upside, there’s a balancing downside. Now, I realize I have to make time to remove, re-level and re-mount every optic in my safe. Actually, I’m looking forward to it. Who doesn’t get excited at the thoughts of shooting better, right?